Over the weekend, Advent GX facilitated an ASD (Advent GX Strategy Deployment) workshop with Imani-Tumani-Upendo (means Faith-Hope-Love in Swahili) founders Jenny Jenkins and Rachel Driskell. 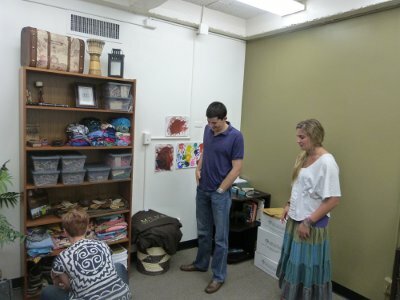 We met in our yet-to-be-renovated gallery on the first floor of the Innovation Underground. It was an inspiring way to spend a Saturday morning. You can learn more about Imani on their website at www.Imani-Africa.com, but the short story is this. Jenny felt the call to support African missions by coordinating mission teams here in the states and doing fundraising, etc. She shared her dream with Rachel and they’ve since formed a non-profit corporation, sent teams in summer 2011 and formed teams that will serve this summer. Imani already has relationships in place with Texas A&M so that students can earn credits for internships AND Imani is working to better represent churches by providing missions coordination support. All this and Imani is less that two-years old. Wow! We will continue the planning process with the help of this group and others and will certainly keep our followers updated on Imani plans through this blog. In the meantime, here are a few photos from the workshop. Logan Hooks films the entire workshop. So many great ideas. We don't want to miss a thing! 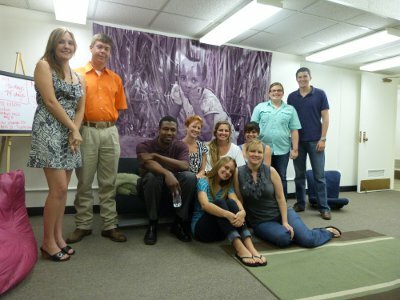 Members of the workshop team pose for a photo in the Imani offices at the Innovation Underground. Jenny encourages Liz and Marty check out the products Imani has for sell in support of mission teams.